Pet Vaccines: Are They All Necessary? "We have no reason to think a cat's immune system is different than a human's immune system. And we don't get vaccinated every year." Recently, there has been a push for many pet vaccines to switch from yearly vaccines to once every three years. In the past it was recommended to give your pet a painful shot every year-not to mention the anxiety of a visit to the vet. But is this really necessary? 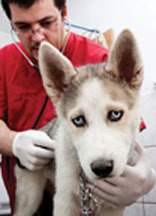 Vaccinations are a big business and often the primary source of income for veterinary clinics. Pet owners generally comply with veterinary vaccine recommendations, often without question, in order to protect their pets from diseases such as rabies or distemper. However, some veterinarians and pet owners are starting to question the wisdom and necessity of annual vaccinations. Dr. Margie Scherk, who runs a veterinary clinic in Vancouver, was quoted in a recent CBC news story as stating that "We have no reason to think a cat's immune system is different than a human's immune system. And we don't get vaccinated every year." If this is true, why do a lot of vets keep warning us to have our dogs and cats vaccinated annually? Of course, some people think that vets are just out to make a quick dime, but the majority of veterinarians are just following the protocols they learned in veterinary school. And pet owners are not anxious to take risks with deadly diseases, and so until conclusive studies are embraced by the medical field, annual vaccinations will often continue to be recommended. However, some studies have shown that certain pet vaccines, such as the Feline Leukemia vaccine, may be linked to increased tumors in cats. Until these concerns have been researched further, some veterinarians take their own stand on vaccinations. Dr. Kruth, who was also interviewed by CBC, believes that owners should make decisions based on the lifestyle of their pet. He explains that hunting dogs are clearly more at risk for picking up some of these diseases than a pet kept indoors in the city. Some indoor cats may not even need to be vaccinated at all if they are strictly indoor cats, as they are not subjected to any immunological challenges. How can pet owners make an educated decision? There is a lot of information available online, as well as recommendations from veterinary schools and associations which may reflect the most recent research. However, many individuals will likely trust the experience and recommendations of their local vet-hopefully someone who is up-to-date on current research. Many will suggest a three year gap between most vaccinations, but there are still some diseases that may require annual shots. Core vaccines are the most critical (such as rabies, feline panleukopenia, feline viral rhinotracheitis, feline calicivirus infection, canine distemper, canine parvovirus infection, and canine hepatitis) and are recommended for most pets. Additional non-core vaccines (such as feline leukemia and canine kennel cough) may or may not be appropriate-for instance, if you are boarding your pet or if they are in contact with many other pets then they are more at risk. In addition, certain geographic areas place pets at greater risk for contracting some infectious diseases.